There you have it - I've just shown you the only attraction we saw at Mostar! HAHA ok I kid. Mostar is a town (or small city) developed in the 15th and 16th centuries by the Ottomans, and later occupied by the Austro-Hungarians in the 19th and 20th centuries. Because of the early influence from the Ottomans, much of its architecture and culture are influenced by the Ottomans/Turks, with the most famous one being the Stari Most, which translates to Old Bridge. After our 3h bus ride from Sarajevo, we walked to our hostel that's near the Old Town and then started exploring the area. As mentioned in the previous posts, again here we see a mosque that's characteristic of the Balkans region. These children clamouring for ice cream because the weather was just unbearably hot! Very soon, we entered the UNESCO Heritage Site that is their Old Town/Old Bazaar. It's listed on the UNESCO World Heritage Site because of its "pre-Ottoman, eastern Ottoman, Mediterranean and western European architectural features", and is "an outstanding example of multi-cultural urban settlement". This is Koski Mehmed Paša Mosque, considered one of the most beautiful mosques in Herzegovina. I'm sorry my photos don't do that claim justice hahaha. 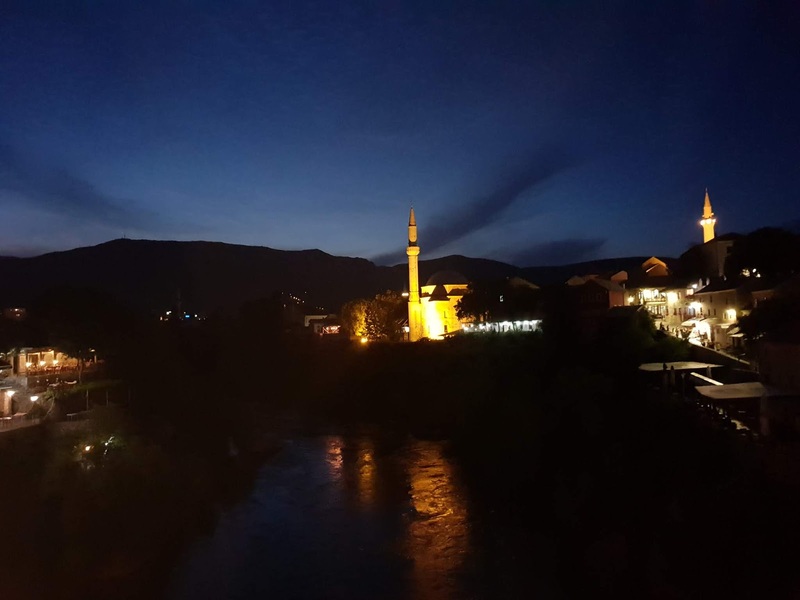 But to me what I remember about this mosque is that the view from the minaret (the tower beside every mosque here) is one of the best places to photograph the Stari Most! Haha. The mosque is situated about 150m north of the bridge, and because its right by the bank of the river, it offers a great view of the bridge and the river below. However, we didn't go up the minaret to see the view because... you have to pay for it hahaha. And we #budget so we rather go somewhere else with a free but still beautiful view of the bridge hahaha! 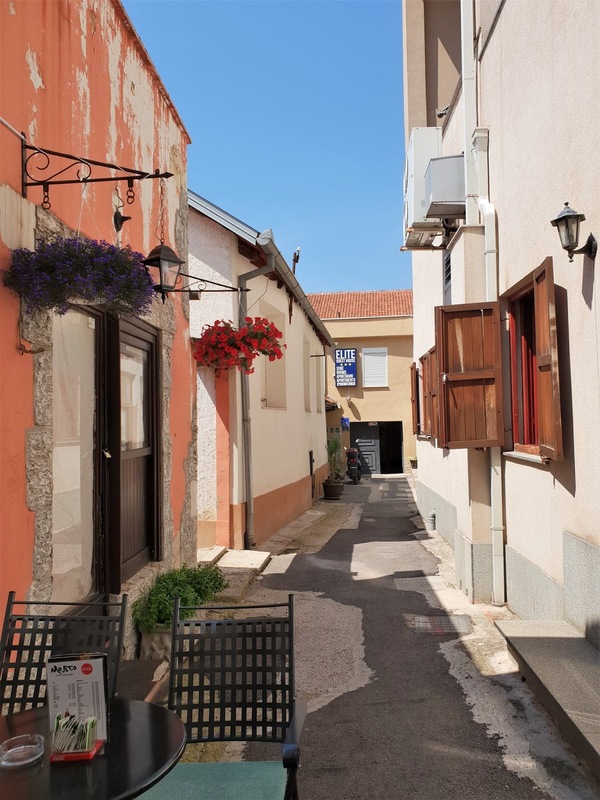 Moving on, as we walked deeper into the Old Bazaar and closer to the Stari Most, the expected kinds of shops start to appear. I.e. souvenir shops. Lol. But the streets really have that Ottoman/Turkish feel. And... ta-dah! Our first view of the Stari Most! The view FROM the bridge itself!! Mostar is situated on a valley, similar to Sarajevo, where the Neretva River runs through (as seen above). Hence you can see mountains and hills very nearby too. The Old Bazaar is a series of relatively narrow lanes on cobbled streets, with riverside cafes, restaurants and souvenir shops. And we decided to have lunch here too. We ordered a Pljeskavica to share because we know that the portions are big lol and we wanted to save some space to snack/eat ice cream later LOL. True enough, it was huge and just nice for the two of us! Can't get enough of their fluffy bread ah so good!! After lunch, we continued walking around the Old Bazaar, and passed by one or two more attractions, such as this Hamam Museum. Basically a Hamam is a Turkish bath, somewhat like the Roman baths but this is (obviously) the Turkish one. Built in the late 16th and early 17th century, this Hamam is the only preserved one in Mostar today, and converted into a museum. And this above is the Kriva Cuprija, translated to Crooked Bridge. If it looks familiar to you, yes it's actually a mini replica of Stari Most! But, this bridge was actually built first before Stari Most, and is like a prototype for the bigger bridge. Of course, it's also for the primary purpose of connecting both sides of the stream. And now back to the actual Stari Most! The Old Bazaar is not big, and we were done walking it in a few hours lol. And there's also nothing much to do/see outside of this area too, so we were kinda left with a few more hours till dinner time to kill heh. Any day is a day for ice cream because... HOT!! Top view of the bridge, taken from the tower at the West end of the bridge. There was a war photography exhibition there, covering the Bosnian conflict in 1990. Sadly, the bridge actually divides the city into its Muslim and Croats side, i.e. most of the Muslims live to the east of the bridge, and the Croats to the west of the bridge. The above photo shows the Eastern side. But another interesting (and happier) fact about the Stari Most is that divers actually jump from the bridge into the river below?? Turns out it's actually a centuries-old tradition where divers jump (and sometimes train) here for an annual competition in July. Today, especially in the warmer months, you can pay the divers a tip and they'll jump for you! The Stari Most of today, however, is not the original one that was first built in 1566. In 1993 during the Bosnian war, the Croatian nationalists attacked the city and successfully bombed the bridge. Imagine the anguish and horror of the locals - their significant centuries-old symbol of the city being destroyed by their attackers! After the war, funds poured in (including those from foreign countries) to help Mostar rebuild its bridge. In 2004, the bridge reopened, a perfect replica of the same cream-coloured limestone, and constructed using almost the same ways and methods. We were hunting down the other vantage points of the bridge aside from the minaret (which we didn't wanna pay lol) and the entrance to the Old Bazaar as photographed at the start of this post. This ^ was one of them! In the late afternoon we went for a free walking tour! Yes, for a small city like Mostar, there's even one! I was quite surprised. So our first stop is the gymnasium, which today houses an international school. As you can probably tell, the design of this building is a blend of both the Ottoman and Austro-Hungarian styles. As mentioned, Mostar was also attacked during the Bosnian war of 1992-1995. And since it's so recent, you can still see the damage inflicted on the buildings. This building above is known as the Sniper Tower. Once a bank, this tower was then occupied during the Bosnian war. Because it's one of the taller buildings in the area, it serves as a good place for a sniper base, where the Croats and Serbs aimed at Bosniaks walking, driving, or even in their homes! Horrible, isn't it... Up until recently, the shattered glass panels and windows were still precariously attached to the buildings. But the government decided to take down all the remaining glass due to safety reasons. 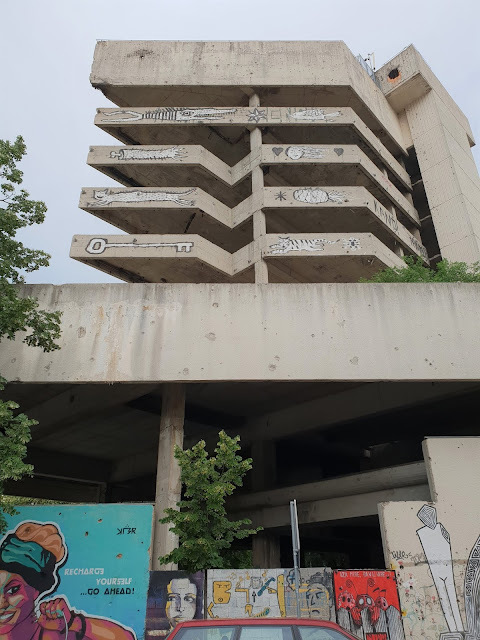 A mural art on one of the buildings depicting the ideal progress between Croat and Muslim ties in Mostar, for both to be reunited with the rebuilding of the Stari Most in 2004. But of course, in reality, things are still much more complicated. The guide told us that today, the leaders of Mostar are mostly ethnic Croats, and tend to be biased against the Muslim population. An example is the delay in rebuilding works on the Muslim side of the river. I personally think it's very sad that Mostar today is even more divided than before. I would have thought that the war would all the more unite the people, but I guess the tensions still remain under the surface. 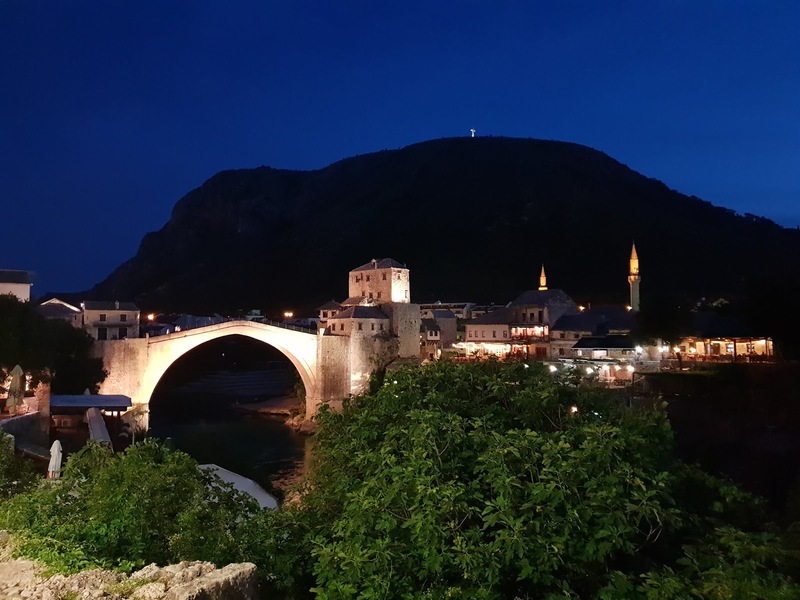 Presenting to you the day and night view of the Stari Most! 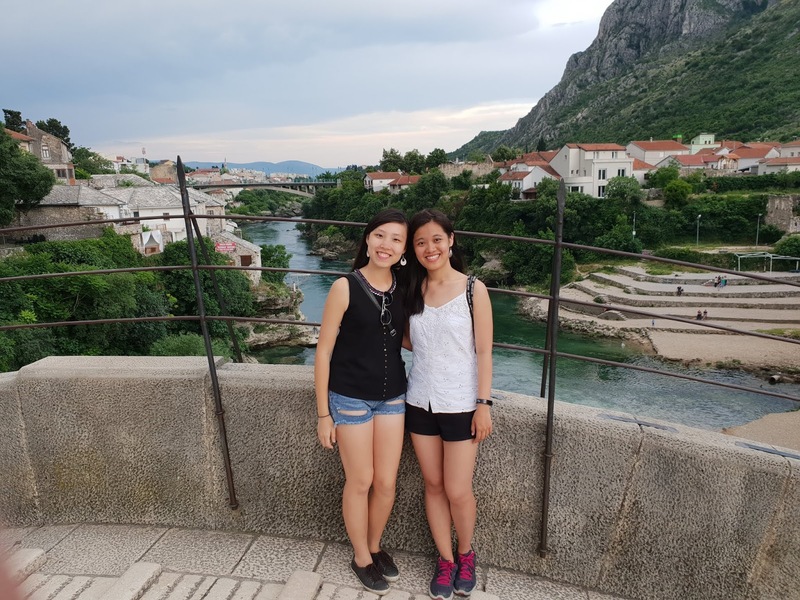 So that was about it for our one day in Mostar. We were honestly glad that we only chose to stay one night here, because... there's indeed nothing much to do here except for the Old Bazaar aka Stari Most! Hahaha. But, there are also day trips that you can consider, but those are more convenient if you have a car. For us we wanted to stick to public transport, which made it hard for us to get to those locations. Concluding thoughts: Overall I feel that in terms of a tourist destination, Mostar doesn't offer much to see, as mentioned above. But I think that going for the walking tour helped us understand the city better, in terms of the current socio-political climate and issues of race and nationality. It's really a pity that this city is still mired in its war history and coping with the various consequences of it. Hopefully with time they may be more like the capital city, Sarajevo - remembering its past yet coming together to write its future.